Ice cream is a complex structure of fats, carbohydrates and water. As the name suggests the water is in the form of ice. 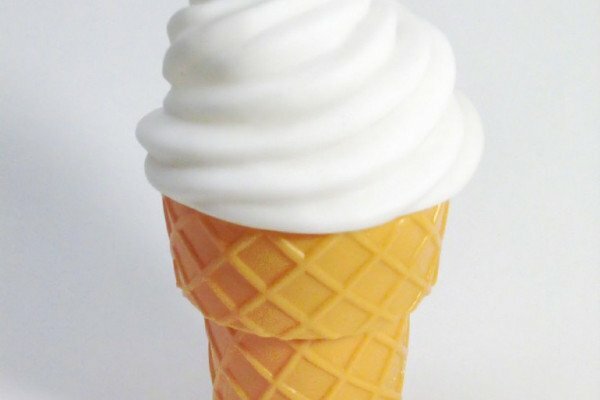 Really good quality smooth ice cream has very small ice crystals less than 20µm across (about a tenth of the width of a human hair). This is achieved by freezing the ice cream very quickly so the crystals don't have time to grow very large and long carbohydrate molecules are added to inhibit the crystal growth. But as you may have noticed, if you let the ice cream warm up then refreeze it, the ice crystals grow much larger which gives an unpleasant gritty texture to the ice cream. Srivassan Damodaran from the University of Madison has been working on this problem by partially digesting long gelatin molecules with an enzyme found in papaya called papin. This chops the gelatin up into short protein molecules some of which seem to interrupt the growth of the ice crystals and keep the ice cream smooth even after refreezing. He was very interested to find out what was going on so he studied the effective protein molecules by looking at their protein sequence, and then compared this to other known proteins. It turns out that they are very similar to a natural antifreeze protein produced by an insect called the snow flea which is active all winter in northern latitudes. Other companies have patented a form of GM yeast produced antifreeze, but this should be cheaper as it is made from a byproduct of the meat industry.